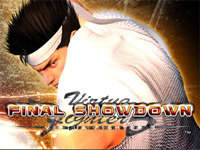 Virtua Fighter 5 Final Showdown VERSION B starts operation today. The game is the same that the VERSION A, there is no balance adjustement or new character. The game will not be compatible with the ALL.NET network. Ranking services for the VERSION A REVISION 1 will be end on March 31. Players can use their current cards to transfert their data to the VERSION B. 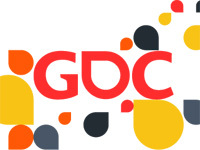 Game Developers Conference (GDC) is the largest exhibition reserved solely to the video game industry professionals. It is currently being held at the Moscone Center in San Francisco and ends on March 6. The first edition held 27 years ago gathered 25 developers. 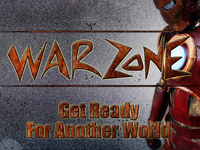 This year, more than 24000 visitors (programmers, game designers, artists, producers,...) are expected. Many conferences, workshops and round tables will be organised. This time, arcade games will be represented by Junya Motomura, director and technical artist at Arc System Works, who will hold a conference at GDC on Friday from 1.30pm to 2.30pm. During this conference named "GuiltyGearXrd's Art Style: The X Factor Between 2D and 3D", he will explain how Arc System Works has developed a new artistic style for Guilty Gear Xrd using Unreal Engine 3 to create 3D characters with a hand-drawn 2D look. Both the artistic (models, textures,...) and technical (programming, rendering) sides will be covered. 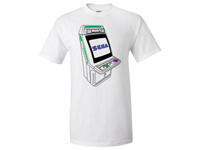 Based in Woburn, Massachusetts, 1cc Shirts prints limited edition T-shirts often bearing an arcade theme. A new design is announced on the first day of each month, orders are then accepted until around the 20th. After this date, the T-shirt model becomes unavailable and new copies are no longer manufactured. Each T-shirt is screen printed by hand and only the ordered number are made. 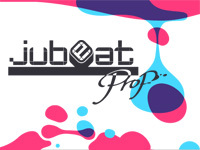 The T-shirts are sent before the end of the month. The March design is a representation of the famous New Astro City arcade cabinet by Sega with the following text on the back: "High-resolution graphics and stereo-of-the-art sound double your playing enjoyment! Aero dynamic shape design. 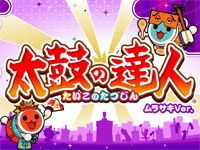 Designed by SEGA ENTERPRISES, LTD. AM R&D #4 project team". This is not the first an arcade machine is in the spotlight since in November, the theme was Taito's Egret II. 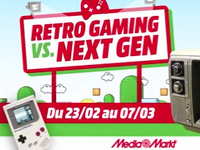 Many arcade brands have already been used such as Cave, Toaplan, Atlus, NEOGEO, Raiden,... The price of a shirt is $25 shipped if you live in the US and $33 for the rest of the world, the payment is made using PayPal. Clothing used as a base is a Gildan Ultra Cotton available in all sizes and in men and ladies models. You have until Sunday, March 22 at midnight EST (Monday 23 at 6:00 CET) to order the New Astro City T-shirt. 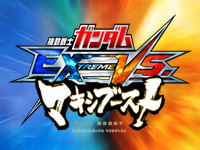 The new update of Mobile Suit Gundam Extreme VS. Maxi Boost is available today. It adds a new mecha (Gundam AGE-3) and a new final boss (Extreme Gundam Mystic Phase). The Gundam AGE-3 piloted by Kio Asuno is coming from Mobile Suit Gundam AGE, an anime series of 49 episodes released between October 2011 and September 2012. 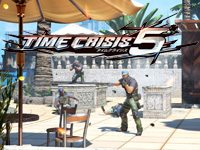 It features the following equipment: SigMaxiss Rifle, Blustia Cannon, Beam Sabers, Smoke Grenades, AGE System, Core Block System, Wear System. The new boss is the Extreme Gundam Mystic Phase piloted by Sthesia Awar Acht. It comes from the Extreme Gundam R serie, a prototype of multi mode gundams created for Mobile Suit Gundam Extreme VS. Full Boost. It has the following equipment: Lance, Wings, Armor Packs. 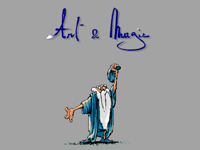 Art & Magic (and Appeal) team will gather in Charleroi on Friday evening for a conference looking back at their career in the '90s. If you grew up with the Amiga, you obviously know of the very impressive Agony and Unreal games, but these Belgian developers are also responsible for Ultimate Tennis which remained the number one arcade tennis game for a long time (until the release of Sega's Virtua Tennis). Their arcade titles also include the Stone Ball prehistoric football game and the reflex-strategy game Cheese Chase. Common to all Art & Magic games is the impressive quality of their graphics, but the game that PC gamers will certainly remember the most is a title they would develop in their offices in Jambes (Namur) under the name of Appeal: the revolutionary adventure-action game Outcast! With its vast voxel landscapes and its open alien world, this game left its mark on many players mind who remember fondly of the many hours they spent exploring this rich universe. 8 games will be reviewed at this event: Unreal, Agony, Ultimate Tennis, Stone Ball, Cheese Chase, Western Shooting, No Respect and Outcast. No doubt most of the evening will be devoted to this last game, but you can ask all the questions you want to the developers present. The following guests are announced: Franck Sauer, Gil Damoiseaux, Michaël Defroyennes, Iwan Peter Scheer and Yves Grolet. The event will be hosted by Julien Annart of the FOr'J organization. I hope we will have the opportunity to discuss Spellsinger and the Lost Child, an ambitious arcade game that was canceled after three years of development and whose only existing prototype disappeared. See you at PointCulture Charleroi (near the Palais des Beaux-Arts) on Friday, February 27 at 19:30 for a special moment. For info and booking, call +32 (0)71/317.147 or +32 (0)472/675.883 (Facebook page of the event). Note: the conference will be in French language.